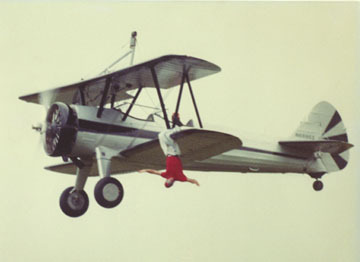 Kirk has done a little wingwalking too! Performing an average of 30 airshows a year, Kirk has never had to cancel a single scheduled performance due to mechanical failures. This is due to the fact that all Kirk's aircraft are impeccably maintained. At the altitudes that his acts are flown, Kirk can not and will not except anything less than perfection! Kirk's love of flying was spawned at an early age from his father. Growing up in aviation, Kirk was destined to become involved in the field one way or another. Learning to fly from his father, he obtained his license in 1985 and three months later purchased his first airplane, a Pitts Special. Another three months and Kirk had obtained his low level waiver and began his life long dream of becoming an airshow pilot. TFor many years, Kirk has been a main stay performer at the Flying Circus of Bealeton, Virginia. Not only flying high performance low level aerobatic routines, but also thrilling the crowds with his dead stick aerobatics in a stock J-3 Cub. Kirk has also filled in on many occasions for the spectacular Charlie Kulp and his comedy cub act. Just another one of many airshow options that Kirk can offer. Along with all this, Kirk has even Wing Walked. Though as thrilling as wing walking was, Kirk decided he would rather fly it than walk on it.